Winner of the 2014 Japan Media Arts Festival Encouragement Prize/New Face Award. I saw it. It was a small, nice, pleasant, sweet, and touching film. And it's Anko-chan Pero Pero throughout - cute girls doing cute things. As anticipated, Kyoto Animation delivers when it comes to simple human drama of teens' friendship and maturing - and Director Naoko Yamada now successfully adds a guy (! ), as well as families, and some good people in the neighborhood (although this mix probably didn't come out too well in the TV series). Yamada proves herself again as a director capable of delicate handling of emotions; by depicting a girl sitting alone in a classroom on a table in silence, the Director lets you share her mixed emotions of sorrow, slight regret, and fulfillment. But the girl won't be left alone by herself for too long, as she has a good friend who wants to "go up with her to a higher ground and overcome" an obstacle. How to overcome obstacles in life is probably the "hidden" theme of the movie (Yamada probably felt that it needed to be tackled after making K-On!). Isaac Newton and his answers to how he overcame his obstacle and found the gravitation theory ("By always thinking unto them") was quoted as a reference (and hence the title of the ending song- Principle; also the story behind the visuals in the ED song of the TV series with the Sun and Moon and Tamako with a different sort of face is now revealed). My favorite line in the movie: "Bitter memories are proof that you did something". Some ways of presentation ("camera work") that Yamada uses, and the way things are told covertly might not appeal to everyone, but I personally enjoy that as originality and creativity- it keeps the movie fresh from banality. Overall, it's an "ordinary" love story, a pure and innocent one, with which anyone with a heart and memory can sympathize (and writhe in shyness and embarrassment). You would almost certainly have a Mochizo or Tamako (or perhaps a Midori - lez or no lez, that's not the matter) inside you. Do you ever get that choked, somehow disappointed feeling when you finish a great show or movie? A void that lingers in your mind, trying to piece together everything you just watched? Perhaps you lean back in your chair, comfortable and content at a good ending, ready to move on to the next one. Or, like me, you curl up in your bed or floor, both incredibly happy but sad at the same time, thoughts racing through the mind. For many, this feeling is a prevalent and very real emotion, but one that is strangely awkward to place a label on. We can't quite stick our fingers on it, and say for certain, "Yep, this particular emotion is what is causing this." For in reality, it is a whole mixture of things, different feelings that have built to create this... suffocation of the mind. When characters become so endearing and the story becomes so interesting, it's difficult to let go of preconceptions and selfish desires. Desires to, for a lack of a better word, fill in the gap for the future of the beloved characters. To want to know more, more about the new world that they have entered through their actions in this movie. How they will grow, how they will learn to cope with difficulties, together. We don't want to be left out of their future adventures, and that is one of the great hallmarks of a truly great show or movie. To leave an impression, and change the viewer's mindset on whatever it may be. And while some may argue that this movie did in fact have an excellent ending that finalizes all things past and present, I differ slightly. It is because it has such a great ending that, paradoxically, it does not. It keeps the future in a haze (although some may argue that the future is clear and defined). It leaves more questions than it answers (although some may argue that all questions have been laid to rest and satisfactorily answered). It selfishly ends itself on a high note, with a cinematic and unquestionable "thud". It tells the audience that all is well, and yet sneaks in the false feelings of anticipation and hope. It dramatically and slowly closes its doors on that beloved story with a smile, leaving the rest of the character's lives up to the imagination of the viewer. Are the viewers to be left happy in the dark, when the play has finished, when the actors and actresses have bowed to the audience, the curtains lowered and the lights dimmed? And in a ironic and unexpectedly cruel twist, one may find that it may have been "better" to end the story ambiguously. Opinion is not the greatest tool of measurement, that much is clear. The opinions of the viewer cannot change what has already happened. All that we can do is reflect on the past and look forward to the future. And the process of moving on is perhaps the most difficult part of watching any show or movie. I feel like I have to make a review for this. And this will also be my first one. Tamako love story is just like a mainstream romance/slice of life anime at first glance. I enjoyed watching it, but there's something that made me love this more than any other romance/slice of life anime, its realistic and simple story. 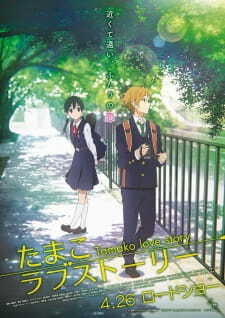 This is suppose to be the sequel of tamako market and the development of both male and female protagonists. But I can say that this sequel doesn't need a prequel, it can stand alone by itself. The story is so simple yet you feel the enjoyment throughout the film and you can share the same emotions as the characters are making. KyoAni's art is expectedly moe-ish but that moe-ish art makes the characters emotions a little closer to realistic. And at the same time, its cute. The sound sticks to a romance genre anime, soft, gentle, and gives off emotions. I really enjoyed the song [koe no uta] It gets right into my heart (dam*). The flow of all the main characters development is perfect, I've learned a lot in terms of love (romance genre, duh). That's all. The enjoyment I felt is not something out of ordinary, I don't know if I'm crazy or not, because I'm smiling from the start until the end of the film. I might go to a hospital one of these days. This film is a must watch for romance lovers, of course you need to watch Tamako market before this, ignore the stand alone blah blah in the story part of my review. Because by watching the prequel, you will get to know the characters more and their everyday lives. And you can feel their love by watching the sequel. Sometimes you don't need a romance filled with actions everywhere, and also, sometimes you don't need a serious dramatic romance. You just need a simple, but profound love to found the perfect beauty of romance. The main idea is so simple, it's about love that appears and blooms between teenagers, a various film that used this plot pattern suffer failure in their ranks, but Tamako Love Story able to bring all of its potentials to the big screen in one piece. We have to notes, that it's prequel (or should i say Tamako Market) is a blank comedy series, filled with fat bird with no sense of direction.Tamako Love Story successfully covered the mistakes that it's prequel made. Kyoto Animation brings us the old tradition of their art. A sweet, clear, and neat art. It is a good art indeed. The sound settings maybe not the best that exist, but it have a nostalgic& well-matched sound settings within the series. Tamako Love Story have a great development, All pieces that scattered in its prequel, is connected creating strong bonds between the two main characters, after watching this I pretend to forget that fat bird to exist. The main character realizes his feelings to the other.